As wonderful as they are to use, iOS devices need pretty regular care and feeding to stay in tip-top operation. Despite Apple's advances in battery life and reductions in power consumption, the iPhone, iPod touch and iPad all need electricity to work. This means connecting pretty regularly to a computer, using a mains adaptor plugged into a wall, or setting your device in a powered docking station, in order to recharge. Otherwise you're left with little more than a pretty paperweight. But just because your favourite iOS devices are plugged in and powering up, that doesn't mean they have to sit there doing nothing at all. iPads, iPhones and iPod touches are so much more than mere placeholders when they're docked and syncing. In fact, some of the most useful tools you'll find are among the apps that made the cut for this list. It's important to keep in mind that each of us uses our iOS devices in individual and unique ways, so there's no single correct way to set up your iPhone, iPod touch or iPad for when it's charging. There are quite a few applications available for purchase and download from the App Store that require little or no direct intervention once they're launched, and together they range from the sublime through the ridiculous to the truly useful. It all depends on what you want to get out them. We've rounded up some of our favourites, from time wasters to useful utilities that will add a bit of sparkle and fun to your iOS device for those hours when it otherwise might just be sitting there doing nothing. We've also tried to keep the budget reasonable for the most part - the majority are available for less than £2, which is money well spent! Air Display lets you use your iOS screen for content you'd rather not have cluttering up your computer's main display. Use Photoshop or another image editing program? Air Display can store palettes and toolboxes. Working from a laptop? Use Air Display to store windows that you can't fit on the limited real estate of your screen. Air Display can also store apps that you'd like to keep open but don't necessarily need constant access to, such as iTunes or Calendar, or your top instant messaging app. But more than that, Air Display lets you interact with that content. Touching the iOS device screen registers as a mouse click, so you can use it to operate apps - everything from simple buttons to painting apps. However, if you'd rather not use Air Display as an interactive display, there's an option to turn the touch input feature off. Air Display even lets you run Flash from your iOS device, after a fashion, as evidenced by our screenshot of us playing a Flash-based game from a browser window on the iPad. Air Display will automatically rotate into landscape and portrait aspect ratios as well, depending on how you have your iOS device positioned. To use Air Display, you don't need to have your iOS device physically connected to the computer you want to use it with, although they will need to be on the same Wi-Fi network. Air Display works using a free companion application for Mac or Windows systems. There are a number of virtual screen applications for iOS, but Air Display wins for us for a few different reasons: It works equally well on both iPhone/iPod touch displays and iPads (and it's a Universal app, so you pay for it once and that's it); the software is well-behaved (outside of some limitations we'll explain next); and it's dead simple to use. That's not to say there are no warts at all to consider with Air Display. There are, in fact, a few limitations you need to think about. For Mac users, Lion support is still a bit spotty, due to what the developer says are OS X driver display issues that Apple is aware of - things that the Air Display developer simply can't fix. A tech note on the Avatron website gives the full details of this bug, but to summarise, it looks like several portable systems, a few iMac models and some Mac minis are affected by it. For Windows users, the Aero graphical theme and DirectX are deactivated while Air Display is used, so you won't be able to run games or see fancy visual effects. And bear in mind that Air Display works over Wi-Fi, so there can be a bit of lag as the screen draws the content from your computer. The trade off can be worth it. Having another 1024×768 pixel display can make a huge difference, especially with apps that clutter up the screen with multiple palettes. And (hopefully temporary) Lion limitations notwithstanding, Air Display works spectacularly well with Macs - when the app's running, your iOS device appears as just another screen in the Displays system preferences. Mac users even get an Auto Connect feature that makes Air Display even more convenient. LiveScore tracks the latest scores for five major professional sports - football, hockey, basketball, tennis and cricket. The beauty of the app lies in its simplicity: while many sporting apps get bogged down in technical complexity, statistical analysis and historical data, LiveScore keeps it simple - really simple. Tap on the sport you're interested in and it'll give you the information you want for its matches. There's no play-by-play coverage here, no colour commentary, no charts and no news. It's just the basics: who's playing whom, where they're playing, and what the score is. That's what makes LiveScore an ideal app to use when your iPad, iPhone or iPod touch is docked. Presumably you're supposed to be doing other things as well, so LiveScore provides a minimal distraction while you're working. LiveScore is the eponymous creation of LiveScore Ltd, which has been tracking sport data live on the web since 1998, and bills itself as the number one football website globally. LiveScore is great for UK sports enthusiasts, but is decidedly lacking for US fans. LiveScore tracks National Hockey League professional ice hockey games in the US, but its overall usefulness pales in comparison to another free sports news app, SportsTap, which covers the gamut of popular American sport fare as effectively as LiveScore does football and cricket. Night Stand's developers took the 'kitchen sink' approach with this app, throwing a little bit of everything into the mix. That should have led to a chaotic, ugly mess, but Night Stand is remarkable for its utility and beauty. It's an alarm clock, weather utility and social media interface all rolled into one. Time and date are displayed in big numbers in a digital flip-clock style. Night Stand shows you current weather conditions and provides a tab if you want to view forecasted conditions for the next few days. You can also log in to your Twitter and Facebook accounts if you'd like to see updates from friends. Night Stand even lets you post from your Facebook and Twitter accounts while you're there, if you see some juicy comment from a friend or colleague that you can't bear to leave unacknowledged. If you're interested in news from websites and maintain a Google Reader account, you can log in to view your own RSS feed, which means Night Stand will integrate quite well with newsreader software on other devices that similarly access Google Reader accounts. 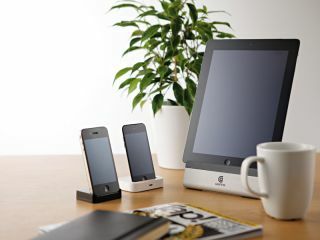 Night Stand's interface is customisable with background images and video. You can add pictures from your own library or download professional photos as In-App Purchases; Night Stand will, by default, apply a gentle pan and zoom effect to the photos to give a sense of motion. Night Stand also includes eight animated movie loops that you can use as background videos, and more are available for purchase in the app. You can't use your own movies, however - they have to come from Night Stand's In-App Purchases. You can set alarms and notifications, so Night Stand's a helpful tool for staying on task. It can even use music from your iPod library as an alarm, though for that to work, your iPad must be on and Night Stand needs to be the active app. Curious whether to pack for rain or sun on next week's trip to Lisbon? Aelios Weather can give you an idea. It'll even tell you how much rain to expect and what direction the wind is coming from. Granted, those features aren't unique, but what sets Aelios Weather apart is the gorgeous interface, which marries a Google satellite map to a rotary interface that looks like a watchmaker designed it. The dial at the centre of the screen displays weather forecasts for a 24-hour period, with midnight at the top and noon at the bottom. A forecast for the next 24 hours is shown outside the dial, with clouds, precipitation, sun and stars showing what to expect and when, along with forecasted temperature and wind speed and direction. Twist the outside of the dial to view a seven-day forecast instead. And that dial is even accompanied by a satisfying gear-turning noise and a dilating iris, like a camera shutter. With such attention to detail, it's a bit annoying that you can't save frequently accessed locations. Kinetic typography - moving words and letters - is cool. (To see one of our favourite examples, head over to YouTube for Stephen Fry's 'Language' essay.) Spout embraces the concept, using kinetic typography to keep you up to date with what's on Twitter, Facebook, RSS feeds (through Google Reader) and Flickr. Spout displays include a total of nine themes, backgrounds, colour schemes and type styles. You can tell Spout to read content sequentially or randomly, and select different animation styles and word speeds. If something catches your eye and you must know more, tapping on the screen stops the animation; tapping on a compass button opens a Safari window so you can read more, but you may find yourself reading the same info over and over until it refreshes. Who hasn't spent hours as a small child poring over a globe and dreaming about far-off lands? Living Earth HD satisfies that popular fascination by rendering our vast planet as a spinning orb, complete with accurate cloud cover and differentiation between night and day. The app includes a search tool to zero in on an area you want to get information about, and it will show you local time and weather conditions. The globe slowly spins on its axis, and as it comes into the night view, you can see the lights of cities dotting the landscape. The edge of the atmosphere even glimmers a brilliant blue - truly breathtaking to behold. A pinch here, a zoom there, and you can easily increase or decrease your altitude; you can also swipe up, down, left and right to reposition the globe to whatever latitude and longitude you like. If you find a particularly favourable view, you can easily take a screenshot. Twitter may have revolutionised the way many of us use social media, plugging us in to a constant stream of updates from friends and family, colleagues and services, but it's hideously distracting. Trickle removes the temptation to post, as it's a passive app that lets you read what's going on across Twitter without being able to respond. While the idea of a forced 'mute' button may sound restrictive, it's actually very handy. This way, you can keep abreast of what's going on in your world without feeling the compulsion to react. If the Twitter bug hasn't bitten you yet but you're a Facebook user, the same developer has created Trickle for Facebook, which works in a very similar manner: simply authorise the app to log in to your Facebook account and you can stay on top of what's happening there instead. What better way to wile away idle time while your iPhone recharges than to improve your vocabulary? That's the idea behind this handy app, which enhances your word knowledge using both visual and audio cues. Reading a definition of a new word every day is fine, but if you don't know how to pronounce it or use it, you may look like a fool the first time you try to casually work it into conversation. Word A Day Visuals and Audios by VocabAhead includes spoken pronunciations of each word, and multiple examples of how they may be used. Entertaining illustrations are also used - helpful if you're a visual learner. Word A Day incorporates additional features to make it a handy utility, including Google-based translations into 50 different languages, the ability to set up a daily reminder, a list of past words, favourite words and the ability to skip ahead a day if you already know a word (up to three days in advance). 'Split-flap' style displays were once found displaying timetables at rail stations and airports around the world. They've fallen out of favour in recent years, but FlipTime XL brings that old comforting analogue sensibility back to iOS devices. FlipTime displays day and date information in that familiar split-flap style, with each numeral horizontally bisected and partly shaded as if part of some elaborate mechanical device, not a digital display - right down to the satisfying 'clickety clack' noise of the digits flipping into place. An analogue clock with a second hand shows you the time. Simple settings let you choose either 12- or 24-hour formats, digit colour, horizontal or vertical animation style and how you'd like the calendar set up. Unfortunately, FlipTime isn't connected to Calendar, so it won't show you appointments or help you to manage your schedule. But it is very pretty to look at, if your tastes run more to analogue than digital. Dr Wayne W Dyer's self-help books have been popular internationally, and now you can capture a bit of his motivational philosophy on your iPhone with Inner Peace Cards, a deck of 50 Affirmation Cards, each with a positive, self-affirming message to help you find inner peace. Each of the 50 cards has positive messages, one on each side, accompanied by a calming illustration. You can shuffle through the deck, view them face up or, to mix things up again, choose one at random face down. You can also email cards to your friends or save them as iPhone wallpapers. We'll admit that this isn't everyone's cup of tea, but it's hard to argue against a positive mindset helping to guide you through difficult challenges.